Barbara Cook, the golden-age Broadway ingenue who became a beloved cabaret and concert performer in the second act of her career, has died. She was 89. Her son, Adam LeGrant, confirmed to Variety that she died early Tuesday morning at her home in Manhattan, surrounded by friends and family. Known for her rich, clear soprano with an astonishing range, Cook shot to Broadway fame in "Candide" and won a Tony for her turn in the original 1957 production of "The Music Man." In later years, she was hailed as one of the premier interpreters of the songs of Stephen Sondheim, thrilling audiences with both her technical skill and her ability to mine a song for the depth and complexity of its emotions. She received a Kennedy Center Honor in 2011. With the June publication of Cook's long-awaited memoir looming, it was announced in March 2016 that Cook would bring an evening of songs and stories to Off Broadway in "Barbara Cook: Then and Now," a new production conceived by James Lapine and directed by Tommy Tune. Although "Then and Now" shares the same name as Cook's memoir, the show's creators billed it as loosely inspired by the process of writing the memoir, rather than as something based specifically on the upcoming book. "Then and Now" was set to play a limited run of 65 performances during the lead-up to the book release. The two-act arc of her career was determined in large part by her battles with alcoholism, depression and obesity. It was alcoholism that derailed her Broadway work in the late 1960s, and her resurgence in the mid-1970s as a major concert artist of the American Songbook was the mark of her recovery. She quit drinking in 1977 and was always very open about her personal struggles, addressing them with the same candor and emotional nakedness with which she approached the songs she performed onstage. "Very early in my career, I was standing in the wings, waiting to audition, and I thought everybody who sang before me had a better voice, looked prettier, had a better figure. I was always a mess," she once said in an interview. "For some reason, it occurred to me that if I could find a way to really learn who I am and put that into my work, then there could be no real competition — because there's only one of me." Cook was born in Atlanta to Charles Bunyan, a traveling hat salesman, and Nell Cook. Her parents divorced during her childhood, and her younger sister died of whooping cough at 18 months. After Cook graduated high school in 1945, she worked as a typist for three years. During a two-week visit to New York with her mother, Cook decided to stay and have a go at finding work as an actress. Early gigs in clubs and resorts (including the Poconos hotel Tamiment, where she worked with Sid Caesar, Danny Kaye and Jerome Robbins) eventually led to a Broadway debut in "Flahooley," a 1951 musical by E.Y. Harburg and Fred Saidy. That show only ran about a month, but soon thereafter she landed the role of Ado Annie in a revival of "Oklahoma!" and went on national tour with the production. TV appearances and Broadway roles — including a well-reviewed turn in "Plain and Fancy," a musical set in an Amish community — followed. Her breakout came in the 1956 Broadway premiere of Leonard Bernstein musical "Candide," in which she played Cunegonde, the love interest of the title character of Voltaire's picaresque tale. Her signature song from that show, "Glitter and Be Gay," in which the character assuages the shame of being a kept woman by finding solace in the luxury in which she's kept, required her to hit more than 20 high Cs, and established her as one of Broadway's leading ingenues, even if the show itself didn't last long. The next year she starred as Marian the librarian in the original Broadway production of Meredith Willson's "The Music Man," originating a role in what would become of the great titles of Broadway's golden age. Her performance as a prim librarian who falls for a charming conman, including the song "Goodnight, My Someone," scored her a featured actress Tony. In addition to "Candide" and "Music Man," she also played roles in lesser-known Broadway shows such as "The Gay Life" and "Something More!" as well as in revivals of "The King and I" and "Show Boat." Her most memorable turn in the '60s was in "She Loves Me," the 1962 Jerry Bock-Sheldon Harnick musical based on the same play that inspired "You've Got Mail." One tune from that show, "Ice Cream," became one of her signatures. In the late 1960s and early 1970s, Cook's battles with alcoholism, depression and her weight stalled her career. But in 1973, when she toured with a concert called "The Gershwin Years," she met the composer, music director and arranger Wally Harper (through Nancy Dussault, one of Cook's fellow performers in "Gershwin Years"). That began a long, fruitful professional partnership: Harper worked as her pianist and music director, choosing and arranging her material, until his death in 2004. It was Harper who convinced Cook to put together a 1975 Carnegie Hall concert that jump-started her professional life and yielded a successful live album. Over the next 30 years, Cook would perform with Harper in concerts halls and cabaret spots around the world. The rich affinity for Sondheim she showed in a 1985 New York Philharmonic concert version of "Follies" — she played former showgirl Sally, one of the musical's lead roles — deepened over the years, eventually resulting in the 2001 Carnegie Hall concert "Barbara Cook Sings Mostly Sondheim." That show, recorded live and released as an album, and subsequently performed in London (where she was nominated for Olivier Awards) and on Broadway (where she was nominated for best theatrical event), cemented her reputation as an unparalleled expert in Sondheim's complex, challenging body of work. 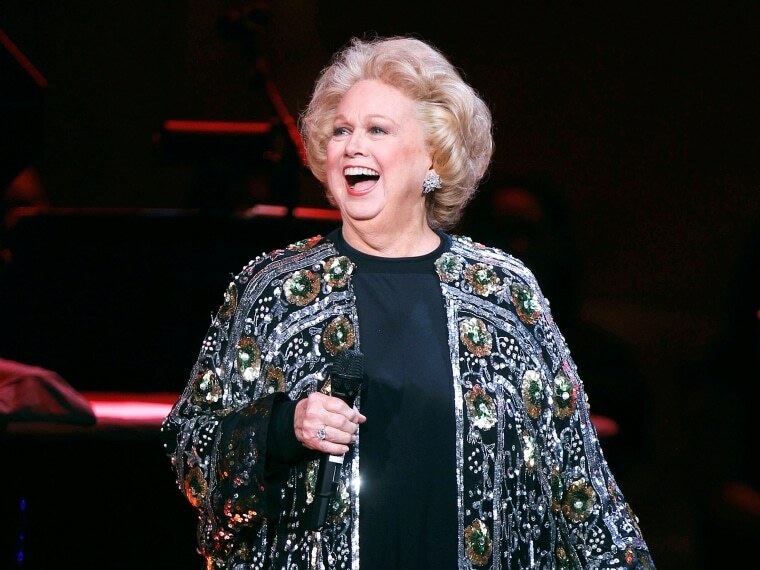 She returned to Broadway in 2004 with "Barbara Cook's Broadway!," which yielded another live recording that would become one of the 40-plus albums (including original cast recordings) she put out over the years. She continued to perform after Harper died, in concerts and cabaret venues as well as on Broadway, where she appeared in the 2010 limited run of the tribute "Sondheim on Sondheim." In her later years Cook's age and frailties began to show. She had difficulty walking, and critics, though no less adoring, began to note that her voice had begun to lose some of its luster and strength. "I'm the slowest bloomer, the latest bloomer ever," she said in a 2005 interview. "I think — barring any kind of big health problems — I'll sing better five years from now, because I expect I'll have more courage to be even more open. Because I believe that's the kind of the road I'm on. I consider myself a work in progress." Cook was married to acting teacher David LeGrant from 1952 until their divorce in 1965. She is survived by their son, Adam.